Like the rest of the country I heard that we had lost two people in a helicopter accident off Fiji yesterday. But when I saw the papers this morning and the front page carried this photo I was jolted somewhat. Here was a face to the name. And somehow it still seemed that part of the family had died, even though I have been out of that family for many years now. In April 1984 two Mirages collided above Bluff Downs in north Queensland. I was posted to RAAF Townsville, the air base from which the visiting Mirages were operating. I was at home at the time and the news spread over the back fences of the married quarters in a flash. I remember all the families standing out in the street in sobered silence. Even the scampering children were still. We were all saddened. Strangely, we had never met Wylie and Rim yet we behaved and felt like a member of our own families had died. This was really the first time the notion that the military could be a family came home to me. A grossly neglectful family. But a family nonetheless. So much so that thirteen years after they died, and after I had departed the service, I visited the little plaque, lost under the frangipani at the edge of the air movements pad at RAAF Townsville, which remembers them. There was a similar personal and community sentiment a few years later when we lost our first F-18 after it ploughed into Palm Island during a late evening training sortie. I drove past the base from university to my married quarter and sensed something was up. There was more activity around the parked aircraft then usual so I called in and heard we had lost young Jefferies. And had nearly lost the CO at the same time if I recall correctly. But again we spent the next week sobered by the fact that we lost someone we knew so well but had in fact never met. One of our own. It is a strange sensation and is some sort of vicarious grieving. Surreal but very real. It happened later again when young McNess and his colleague were lost in a F-111 accident. McNess had just moved in across the road from me and I hardly had gotten to know him when I read his name in the paper. He was another of those keen shiny faces that came issued with every new F-111 aircrew member, reflecting their disbelief at the fact that they were actually flying these amazing planes. Yet revelling in every moment of it. Barely introduced and then gone. So when the defence chiefs get up and declare to the press they are saddened by the loss I am inclined to believe them. I am not so sure about the politicians. There are two exceptions for me – exceptions in the sense that the grieving was not vicarious. Shorty and Hobbs. Two F-111 crew who I knew well. Steady. Keen to be friends. Hobbs so ready to help in my first days in the squadron when I was still trying to work out which way was up under the stern gaze of the OC each morning. Shorty, always trying to know more, asking endless questions. Quiet but quick to laugh. And both forever forgiving of our (non aircrew!) shortcomings. Both keen to help, and both very inclusive, welcoming us into the squadron fraternity and making us feel part of the club.They died in a F-111 accident in 1999 in Malaysia, years after I left the squadron. That loss I felt keenly. And rued the inability to say goodbye or to somehow express the connection I had with them. I regretted not knowing them better than I did. Men’s men who were all that was, and is good about serving in the military. I remembered them both today when I picked up the paper and grieved the loss of Captain Bingley, a man I never knew. Funny what prompts you, but I was just bouncing through another blogger’s site where the author had a quick note to observe how grateful she should be for the things she has – but is often not. My own response is usually a glib line but it is a conviction as well if I test myself – that I am grateful every day that I awake, that I am breathing, and that I am upright. Sometimes I am OK with that formula if the upright bit is left out. But breathing is always a good start. Anything from that point on is “up”. That I have a family. Who loves. And who I love. That I have friends who pray for me. And the family. Who pray when the going gets tough. Who keep me grounded by reminding me that I need prayer – that is, I can’t do all (any) of this by myself. Five minutes in places like Yemen, China or Vietnam, or the Sydney Central Station reminds me that I should be grateful for he material things I have. A job. More money than most in the world. Fresh water. Choices of food. Ability to travel. Freedom to worship. To vote. To say what I think. All freedoms the majority of the global population, in all its history, has ever had, or even has today. To the Author of all this and more – thankyou. September 11 2006 <?xml:namespace prefix = st1 />Beijing: We met Liz and Al and took bicycles down to the Forbidden City, but via Beihai Park. I love the tickets they issue to these places – very sharp looking but only a few cents to buy. A collection of these tell your story by themselves. At Beihai Park we took photos and posed for photos. Even though the temple was under repairs – as a lot of the city is, for which everyone can thank, or curse, the 2008 Olympics. One of the tourist attractions up on the hill, popular mainly with local tourists it seemed, was to pose in emperor’s garb for an outrageous fee. <?xml:namespace prefix = o />None of us were too keen on the idea of dressing up but some parents with their four year old were having their young prince pose in royal garb. For some reason his grandmother decided I was “pretty” and wanted me to have my picture taken. Under increasing pressure I did so. We ended up having a picture taken with her sitting on the throne beside me, with my arm around her. She thought it hilarious. She was delighted to the point of paying for additional photos which she proudly showed me when they were printed. She got a kiss on her forehead for her trouble and seemed pleased with that. It certainly added to the spontaneity and atmosphere of the afternoon. I did not come away with a photo of grandma. Only one of the Pickled Eel as Emperor! 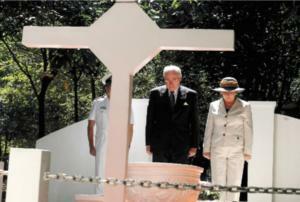 Yesterday the Australian Prime Minister of Australia laid a wreath at the site of the Long Tan battlefield in southern Vietnam. It is rightly famous for the Australian infantry who beat off more than 2000 enemy. There are criticisms by Australian veterans about how this battle was forgotten, nay even rebuffed by those in government at the time. That veterans received inappropriate, or worse, no recognition at all for their efforts. They accuse various governments of short memories. But there are other short memories about that war that we should be thankful for. Visit Vietnam and discover how few are aware of the war. Vietnam has one of the highest under 25 year old populations in the world. And they are all hell bent on securing the materialistic future they see in the Western media. Drink at Starbucks, ride the latest Japanese motorbike, shop for the latest fashions and have the latest accessories. Some have never heard of the war of aggression we call the Vietnam War. More remarkable is the handful of Vietnamese you might be fortunate enough to meet who hold no grudges despite their losses – material, social, filial, fiscal. And mental. I met an amazing woman we simply called Grandma who had fought the French, fought the Americans, lived in the Cu Chi tunnels, fought the Cambodians in 1979 (she lives on their border near the “Parrots Beak”.) On occasions she helps coach junior diplomats from the US Embassy. They know nothing of her background until the end of their time with her, when she takes them through a review of her martial life. The impact is dramatic, and was for us too as she laid out her experiences with great pathos and compassion and humanity. What a remarkable thing to discover that in someone who had every human reason to harbour a grudge was a person who held no grudges. Resented no foreigner. Only wanted to build opportunities for her children and grandchildren. We go to Vietnam today with something of a self conscious cringe, hoping they will not resent our visit. Worried about what they might think about those of us coming from aggressor nations that killed more then three million of their citizens. They welcome us with open arms, great humour, an earnest desire to know about us, to practise their English. And take our money. But through their open honesty and driving passion to build their nation they remove our cringe. A humbling experience, built on their thankfully very short memories. Unless distant family was involved in the US Civil War there is almost nothing to connect an Australian with a war that threatened to rip a nation apart, eventually welded it, and which still resonates more than 140 years later as something sentimental and patriotic. And divisive -flint eyed southerners will tell you they are going to “do it again”. As it turns out I have distant family connections that were involved in both the War of Revolution and the US Civil War. The first time I visited a US Civil War site it was in 1989 and I had no awareness of those connections. However I had the good fortune to discover in the Wheatfield a connection woven of common humanity, and I was fused to that place by bonds that have everything to do with the blasphemy of spilt blood and the gnashing of emotion as you realise you stand where brother slaughtered brother. Stand in the middle of the Wheatfield and be the only person there, in quiet, stunning lark punctuated silence, knee deep in grass, turn slowly and see how small the field is as the woods close in on you. And ponder the thousands who perished here in three short days. I connected with America in, of all places, the Wheatfield. Poetic language which says more powerfully something that touched me as I looked around that wheatfield. And since 1988 there are any number of stories about that battlefield I have gathered in my head. But one sticks out above all others. It is the story of an old man and the common spirit and vision we shared with him. It is my habit when visiting the Gettysburg battlefield, to park my car and then walk every inch of ground I can. Only in climbing or descending Little and Big Roundtop can you appreciate what tough ground it was to fight through. Lie in the Devils Den and understand the advantages and disadvantages of your lair – and just how close you are to sharp eyed soldiers across Plum Run. Or closer. How men came to be trapped there and die with no one knowing. And walk Pickets Charge and comprehend the despair and futility and hopelessness and unexplainable courage of the men who pushed the Union Line. It only takes twenty minutes to walk from Lee’s statue which marks part of the Confederate jumping-off point to the top of Cemetery Ridge, their objective. Stand there and marvel that anyone got that far in the face of canon fire and musketry. A steady walk across open ground into steady fire. In 1997 I was walking Pickett’s Charge. It was September. Still hot but not with the high humidity that July can bring. I was walking with a friend from Slovenia, Andre, who knew the site well and who had been touched in some place by what this battlefield represented. Being from the Balkans he knew only too well what brother fighting brother was really all about. Chamberlain would no doubt be amazed that his battlefield would connect with two foreigners from opposite ends of the earth. We were of a generation he knew not, from afar, but most reverent. As we climbed the shallow incline we were distracted by the struggling figure of an old man who was clearly making a hard job of the heat and the uneven ground, and we hastened forward to catch up with him. On reaching him we offered him assistance but he gruffly rebuffed us. So we offered him some water instead which he gladly accepted. As we spoke he realised from our accents we were not locals and so asked us from where we hailed. When he discovered we were from Australia and Slovenia he was overcome with emotion and for a moment Andre and I thought we had a heart attack victim on our hands. As the old fellow straightened up (continuing to rebuff our offers of assistance) and wiped his eyes he told us he was 86 years old. That his grandfather had somehow survived Pickett’s Charge in July 1863. And that every year on the anniversary of his grandfather’s death he walked Pickett’s Charge. Had done so every year since before he could remember – he had been carried there as a baby by his grandfather who walked up there once a year to remember fellows ground into eternity by Union guns. And in the mind of this old fellow the best way to honour the memory of his grandfather was to walk this field alone, all the way to the low stone wall along the front of the copse where Meade has blasted Confederates all day at point blank range until many of his own men wept at the carnage and refused to continue the slaughter. This old gent had it in his head that he had to walk this walk on his own, to reach the High Water Mark of the Confederacy (that stone wall) unaided. Regardless of health. Of weather. Above the protests of his family – he pointed out a car parked near the copse. Said his daughter was waiting up there with a first aid kit and oxygen tank “just in case”. We asked him if we could walk with him and he was clearly moved. He was amazed to discover two foreigners who were familiar with the battle, familiar with the place it has in American (and world) history, but more importantly, who had discovered some other less concrete but no less tangible connection with this bloody ground. So we walked in a slow shuffle, probably no faster than the shattered bodies were able in the face of all the leaded fire, and under the rain of steel shot one hundred and thirty four years earlier. This day there was no noise or smoke or shouts or battlefield moan of expiring or striving men. Just the three of us. One American. One Slovenian. 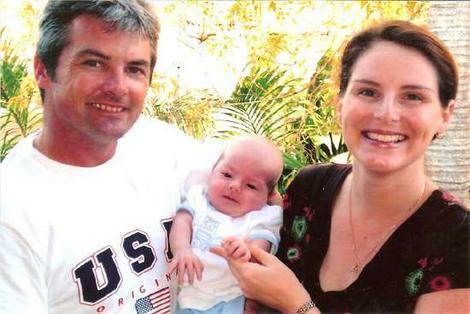 One Australian. All men. Silent in our shared humanity and companionship. As the old gold Mercury slid slowly and silently over the ridge and out of sight towards the town of Gettysburg with our new old friend, it occurred to me that we had not asked about those in his family who might continue this tradition of remembrance. To have the power of the vision pass into their souls. As we looked at each other we knew we had not needed to ask. Without any words he had declared there were none. I have been asked about the reference to Cu Chi in the photo. 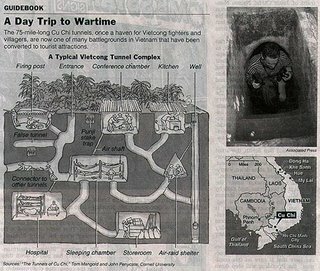 Cu Chi (“coo chee”) is famous as the site for the tunnels built by the Vietnamese resistance, or Viet Cong, about 45 kilometers from Ho Chi Minh City (Saigon). Being this close to Saigon they were used to focus attacks into the heart of the South Vietnamese military and political administration, including that of the Americas during the Vietnam War. Earlier they had been used in the fight against the French. In military history they are infamous for the fact that the US Army 25th Infantry Division set up base right on top of them. They are famous for the Australian and American soldiers (Tunnel Rats) who, armed with only a torch, a pistol and their courage, went into the tunnels to hunt out the resistance. But they are especially famous for the amazing length and complexity of the tunnels. Here people lived and ate and slept, and died. Here they had workshops, hospitals, schools, manufacturing plants, storage facilities, training rooms, generator rooms, kitchens and wells. First dug in the late 1940s and in used right up until 1975 they are a potent symbol of what lengths people will go to in order to secure their own land and take control of their own destiny. I crawled through a one hundred metre section of these tunnels, apparently widened to accommodate bulky visitors. But they were still a very tight fit. It took some effort to negotiate hard turns left or right or up or down. And I was forced to take a deep breath when the lights went out and our guide vanished into the darkness. Thirty metres underground and no way to back out – and in complete, smothering blackness. And no way to see forward. You only have one choice and that is to feel you way forward until the little lamp of the guide finally came into view around a sudden corner and down a sharp drop into a hole. I made more of an effort to keep up. And did so with a newly inspired respect for those who lived and fought their wars in these places. “Off to School in Shamoo”? Now that sounds like something out of Dr Seuss. In fact, something just as wonderful and weird as Dr Seuss. But not as wobbly and wavey. In fact, quite the opposite – something very real and concrete and solid in my experience and in my mind’s eye. Shamoo is a village in Eastern Tibet. Is that how you spell the name? I have no idea. But that is what it sounded like so that is how it appears here. I heard the name spoken thus by a school teacher who had come up to the centre of the village to buy pears from a travelling fruit merchant. He had a set of scales with weights he placed in one tray and the pears in another. He seemed pretty quick with the weighing operation, so much so that I wondered if he was being a bit shifty with the weights. But maybe his deftness was motivated by the swarm of wasps that hung around the ripe pears. He wanted to be done and gone before he was stung. But I thought moving slowly and keeping any pear juice away from my face would have made more sense – lessons I learned from growing up with these things trying to share anything sweet I might be eating or drinking. The centre of the village is a Y shaped fork in the road, one branch taking you further up into the mountains of this remote part of China, the other continuing on down past the school where the local children and those from around the district took their lessons. Walk down the hill from the pear seller and his humming wasps, away from the little shops selling food, repairing car parts, selling clothes and hawking tea. Down through the dust for two hundred metres, veering left into a lane decorated with birch trees, as pretty and petite and fine as any birch tree anywhere. On your right a farmer, wearing the distinctive white hat of the Muslim Hui (pronounced “whey”) struggles a couple of ploughing mules to a stop, all the better to get a look at you as you wander up the lane. Walk past a tall, old kindly faced man who stops sweeping his straw broom over the lane to lean on its shaft, and observe you and who offers a slow and open smile and the Mandarin greeting of “hello” which sounds like “knee how”. Naturally you respond in like fashion and hope you said “hello” in reply and did not say something offensive. On your left is a tall brick wall and from behind it come the sounds of a tinny loudspeaker system counting out numbers in Mandarin. “Ee” “Arh” “San” “Sher”. No that is not how they spell them but 1,2,3,4 sounds something like that. Arrive then at the school gate and turn left into a large school yard. The excited school children that were scattered in twos or threes outside the gate swell to an enormous number as they crowd around us, chattering and laughing and simply looking at us. I don’t think I have ever had a welcome anywhere quite like this. Imagine you have never met another foreign person. Ever. Not ever. But you had heard about foreigners all your life. You had seen them on TV. You had never seen a Chinese person. An Indian. A Malay. A Fijian. A Maori. An Arab. Never met someone from Greece, Italy, France or Germany. Someone from Africa, Chile, Iceland. Imagine that the only type of person you have ever seen or heard is exactly like yourself. Then imagine that for the last two years or more you have been learning the language of one of those countries. From teachers who had learned the language in the same school you are now sitting in. Imagine that the teacher cannot answer many of the questions you have about these people and their language since she has never met anyone else except her own neighbours either. But also imagine that there are all sorts of legends, stories, fables and myths about the foreigners who speak this language. Imagine that some of those fables tell about massive wealth. About amazing technology. 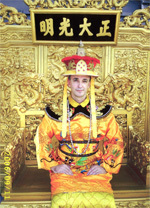 Imagine that you know this foreign culture has many things like music and fashion that you cannot get. But would like to get. A few fables are wonderful stories about how some of those foreigners have helped your own people, with medicine, engineering and aid. But also imagine that those myths and legends tell tales of terrible abuse, cruelty and hardship. Of horrible wars and of exploitation. Then imagine you are told that, if you learn their language, you will stand a much better job of getting a job, and possibly getting out of this village. Or maybe imagine that you are told to learn this language – for no apparent reason at all. Imagine that sometimes when having a cup of tea, in a local café with the only TV in town, you see and hear some of the language and people of this language. They seem strange. And far, far, far away. For you live in a remote part of the world. Not even your own people travel here since there is nothing, absolutely nothing to look at. At best, your village is a bus-stop on the road to nowhere. As we walked into the school year we had no sense of this perspective. We all wrongly assume that everyone knows what we know. That we all have access to the same information. The same experiences. The same opportunities. Perhaps knowing something about this village will help you understand just how far from the truth these assumptions really are. To get to Shamoo you have to travel a long way up into the mountains of Western China. You drive up through the beautifully named Sun Moon pass, littered with Buddhist stupas and prayer flags. Down into a broad valley surrounded by rolling, grass covered mountains, guarded by more angled, purple hazed peaks in the distance. You are elevated higher than Mt Kosciusko by a few hundred metres, the height catching you a little breathless if you try and exert yourself. This will be a bleak and hard place in winter. But today it is a warm and pleasant autumn day, although the locals are well rugged up. Just in case I guess. Shamoo is home to about one thousand people. A many as say, four trainloads of people that pull into Spencer Street station each morning. There are no street lights. No kerbs. No hotels. No post office. No bus-stop. No petrol stations. No pubs. No rubbish bins or rubbish service. No police. Not much at all actually. There is a Chinese medicine man who is four feet tall, stuck behind his hesian door (embroidered by a red cross and which had caught our attention) and who was sorely disappointed that I would not take the couch and be examined. He is the most exotic thing in this place. There are plenty of tea houses and café type eating places. The Hui are, after all, well known for their fine cooking. That reputation is truly justified. People wait on the side of the road for any vehicles going in whatever direction they happen to be travelling and hope for a bus (twenty seater), trucks, motorbikes. Farmers mingle with farmers. Shoppers who are coming or going to markets. Tibetan monks. Teachers. Mud brick houses. The public toilets are an acre of open ground behind the string of little restaurants. If, while eating, you signal your wish to use the bathroom you are guided to this open ground, surrounded by a thin (non existent) hedge of birch trees. For those who wish some privacy there is an open sty of a shed which affords some modesty . Watch where you walk while heading over to it. The largest building, mainly out of sight down the hill is the school. More than 1200 students. How can that be when there are only 1000 people in Shamoo? Many of the children bus into school and some come so far they actually board there as well. But the travel rules are strict. If you live more than three hours walk away then you are entitled to a bus ride to school. But if you live say, 2 hours and 45 minutes walk away well, then you walk to and from school each day. That would be like walking from Camberwell into Melbourne city each day – and back, just to attend school. Here is the problem for these children – Mum and Dad need them on the farm to work. Many can’t finish school, or take a long time to do so. We met a class full of students – 48 in all. They ranged in age from 10 through to 16 years, some attended at an older age simply because they could not get the school hours in during earlier years. We had actually been invited to take an English class. So we invented a lesson (teachers do that sometimes) based on an Aesop’s fable (a lazy donkey is purchased by a farmer, the farmer places him in a stable and the donkey gravitates to the lazy animals. Farmer returns donkey and demands his money back since he figured the new donkey was going to be lazy too. Moral: you are known by the company you keep) – short, words were relevant to a farming community and we only had to fill an hour. In the end the lesson ran for two hours, we taught them to sing “Baa Baa Black Sheep”, along with describing all sorts of Australian animals (they have anteaters so the echidna was a hit), all supported by lots of sketches on the blackboard. As we walked into the class we were confronted by students suddenly standing to attention behind their desks and applauding. A bit embarrassing. We sat them down, dampened the clapping, took a deep breath and introduced ourselves by doing that age old teacher thing of writing our names down on the board. The names were instantly copied into their books. Even the donkey I drew later, ended up in their books. And the echidna, koala and a few other mad sketches. While we wrote on the board the room was in complete silence as they copied words into their notebooks. Students stood when answering questions. They were respectful, intense, earnest, polite – and delightful. And so very eager to learn. This after all was the only chance most of them were going to get to obtain an education. So they were grabbing it as hard as they could. And they could mimic an Australian rounded vowel extremely well. We were very proud of their “g’day mate” which they parroted beautifully. The school had none of the amenities we associate with a school. No ovals, playing fields, climbing equipment, or trees. Only basic buildings, an open, earthen playing area, and a basketball court. And the classrooms were spare as well. Our classroom had none of the trimmings you would expect in an Australian school. There were pictures of Lenin and Marx and Mao and a map as the only decorations. But no student drawn paintings. No pictures, maps, or other resources. No projects on display. Nor it would seem was there any heating or air-conditioning – the only heating we saw was the pot bellied stove in the headmasters office. In fact, while thinking about their resources let me tell you about their toilets. These were found in a shed on the edge of the school grounds. Here you need to apply some imagination again, but let me help you. There are no cubicles. No running water. There is no lighting apart from what filters in through the door. No towels. No paper rolls. No hand driers. No cleaners who turn up after school to make it clean again. No deodorant. No disenfectant. It is a damp and cool place even on a warm day. It will be an ice box in winter. Cut into the concrete floor are four holes, side by side. No toilet seat or bowl or other support. Here you squat. Some of your predecessors have not been too accurate so there is a muddy, smelly slurry on the floor (imagine in deep winter this being smeared over layers of ice) that you have to stand in to get yourself over the hole. You can see down through the hole in the floor into a muddy pit and the bright light shining in from the back of the building confuses you for a moment – you are not sure what the pattern is but it slowly dawns on you that you are looking at a seething mass of maggots. As a student at this school you would figure this to be a normal experience. You would know no different. But even if you did, and decided to “hang on” to avoid using the toilets, you would be hanging on for eight to ten hours – some of the classes start at 7am and don’t finish well into the evening. Imagine then your two and half hour walk home after that! We would think these children doing it hard. But they all seemed very focused on learning as much as they could, when they could. For even being at this school was no guarantee that they will get a job, go to university, or do anything except go back and work on the very small family farm. And they are very small. So this is a very different Dr Seuss story. But it could be told like one. From the point of view of one of the students. Awake in the dark. Get up and have breakfast. Or not, as may be the case for many. Walk for two hours across mountains, streams and through copses of birches and arrive at the school by 7am. Maybe it is winter and you are walking through snow. Arrive in an unheated classroom. Take your lessons. Learn some English. Use that toilet block. Have two strangers from a strange place talking a strange language come and help you talk some of that language. What do you think of these strangers who are far taller and much fairer than anyone you have ever seen? Do they frighten you or do they make you laugh? Are you excited? Eat your lunch at the school cafeteria (the government helps there) but only for thirty minutes. No parents picking anyone up at the end of the day. Everyone walks home. To do some work. But mainly to sleep so you can do it all again tomorrow. Six days a week. I walked out of the Ho Chi Minh CBD, such as it is and into District 4. I discovered later that locals recommended District 4 should not be on any walking tour for visitors, it being too dangerous and violent. Something of a slum, and I suspect that is the real reason why locals don’t want us to wander around in there. As I wandered down a side street off a side street off yet another road I was prompted to stop by the interrogative “Where are you from?” and following my reply, an invitation to have a beer. So I sat on a small child’s plastic chair in the shade of a brown umbrella in the company of four middle aged men, a wizened grandfather and a diminutive girl. Given the choice of Heineken or Tiger (or drinking from dirty beer bottles from goodness only knows where) I elected Tiger and was promptly asked for 20,000 dong. This was then handed to the little girl who promptly ran off up the street and disappeared. Gypped again. She was replaced by an older woman who turned out to be the grandmother of the girl who just did the magic disappearing act with my money. This was getting weird. Suddenly two beers actually appeared (inside I chided myself for being so mean spirited) and the child was introduced as Mai Khang, a seven year old who has been learning English for two months. Her pronunciation was excellent but perhaps most striking was her enthusiasm to try new words, and to experiment. So we played with words and phrases and used this journal to help write down things we could not otherwise convey to each other. We had a delightful couple of hours with this family. Grandfather had a smattering of English which was distilled to a favourite sound-bite of “number one” accompanied by a thumbs up and a crinkly smile of his deeply tanned face. We toasted each other with warm beer(two became four became six), shifted alternatively out of the sun or rain, practised our colours and otherwise slowly killed time. Eventually the group grew to include other children, elderly folk who climbed into hammocks and swung themselves to sleep. Other adults appeared and sat around. Some just sitting on the periphery and enjoying the afternoon. Others groomed each other in a meticulous manner suggestive of a de-lousing session. To cap it all off a ride back to the hotel with the father of Mai Khang, on the back of his motor bike. Somewhat precarious and initially not in the direction of the hotel, which was starting to put me on guard – maybe this was not a good area to explore after all. But my misgivings were unfounded as he took a circular route back to the hotel, clearly proud of what he had to show me. Delivered safely back to my hotel in the open and trustworthy manner in which the whole conversation started. His tour took me through the lanes and muddy paths which stretch down to and along the Saigon River. Here were warehouse still with a colonial air. But here mainly were warehouses that were used to house stores shipped in during the Vietnam War. Two conversations are stuck in my mind. Mai Khang’s grandfather was a stevedore for the USN. He said he loved that work, loved the US people he had worked for, loved the opportunities, the money he earned. Still could remember the names of the servicemen he worked with, and wondered where they all were now. A poignant moment and loaded with honesty, severed friendships, long memories but no animosity. Just a sadness at friendships he had no hope of renewing. A little later in that same warehouse area we met an old, old woman. Actually she was probably only in her late sixties but life had been tough on her and her toothless grin and peasant clothes, unkept hair and bare feet spoke all that needed to be said about the course of her life. You see people like that all the time. But you don’t always hear even the smallest part of their stories. She was different for she gave up all her heart and hopes when she asked if we, the first white faces seen in her lane in thirty years (we had poked down into a very remote area of District 4), knew Paul, where Paul might be. Paul was her US boyfriend who suddenly left thirty years ago when all the US military suddenly left and she could not understand why he had not come back for her. Since then she had not been able to get work but held out a hope that her young knight in green camouflage armour might reappear and rescue her from her District 4 prison. She, a beautiful Vietnamese girl who was all a man could desire. She asked and looked earnestly at us for an answer. How do you respond to that question knowing that an honest answer would destroy any hope (if it was really there) and a lie would be just that and give her a false hope? How do you encourage her, build her up, not deflate any hope she has in her heart? How do you look her in the eye and tell her a lie when what was probably seductively Asian thirty or so years ago is now wrinkled and dried out, frail and broken, unlovely in the eyes of even her own people? As I stood there and looked at her, with young children laughing and scampering around our feet, trying to pose for photos I thought of the boyfriend. What memory would he have of her then in his minds eye? And what would he think if he met her now? Then I took another mental snapshot of him; no doubt living like a lot of retired servicemen I have met. Probably still has a vision of her and himself as fit and youthful twenty somethings – but who is now overweight, out of breath and living in a trailer by himself with a mongrel dog and two stray cats in the lost blocks of Louisiana somewhere. We lied. So she continued to smile her toothless grin of hope as we edged back out of the lane through the spilling kids. Silent we were, in the face of a vanquished life. First day wandering out into the streets, with no map, to see what I can see. Now I am not sure where I am but the general direction I took from the Saigon River was towards the local markets. Past cages of dogs, puppies and green snakes, all stupefied by the heat save for one yappity beast chained to a fence. No one seemed bothered by his noise but its desperate tone caught my ear. Even the snakes, which seem to me to be capable of slipping away through the bars of the cages, seem too whacked out by the heat to even blink let alone stretch a coil. After making a mistake by taking a map out of my pocket I am suddenly accompanied by a motorcycle rider who offers to take me to the markets. His price starts at 5000 dong and eventually drops to a friendly free ride after I manage to rebuff him and keep walking – the markets were, after all, now in sight. Or so I thought. That rebuff took three blocks to come into effect however – he idled alongside me, kerb crawling, continuing to haggle and not wanting to give up any prospect of making money. His name was something like “Sail”. He also asks me if I like bar girls, perhaps hoping that this will secure a sale. He eventually tires, though his persistence is admirable, and he rejoins the flood of bikes. People are certainly friendly, calling out “hello” and “hi” and “good morning” just for the sake of it. They clearly enjoy getting a response. I have in my pocket a card from a taxi company, the result of a driver talking to me in the street and telling me his story. I also got talking to a chap this morning who had a little pocket diary he clearly treasured. Well worn, grubby and dog eared, he proudly showed me though was reluctant for me to touch it. A great treasure it seemed. And in a sense it was, for it contained brief testimonials written in the hand of previous customers he had taken on personalised tours – all of these testimonials extolled his integrity, honesty and local knowledge. His thorough grasp of English commended his potential services as well. Testimonials came from all over Europe but most seemed to come from Australia, and those from Melbourne. His is no sampling poll but there were dozens of annotations and Australian visitors seem to be a large demographic coming to this country. Not only dozens of workers but the police ride scooters as well. One just trolled past with his folding stock AK-47 strapped over his shoulder. A reminder least we forget, thanks to Prada, Western Union and any other numerous Western brands you can see on a walk like this, that things are still done a little differently here. The breeze, stirs, the sun is melted by a heavy, boiling cloud, the humidity squeaks. Will it rain? No idea? Just as well, since the markets were in fact another five steamy kilometres away. I should have accepted the ride, even at 5000 dong. The Forbidden City is one of those names you find in China that has real, evocative, poetic power in just the name itself. Forbidden to whom? And for what reason? And a whole city?! – are you for real? If your disposition is so inclined, it is also a name that makes you want to climb the wall and get inside, just to show it is not so “forbidden”. I wonder how many local Chinese felt so drawn in the years that it housed its emperors, from the early fifteenth century through to 1911. Quite a few like me I suspect. Now of course tourists pour through the city and what was closed and forbidden is no longer. It has lost none of its allure for that. Rather, for me there is additional potency in the site for the simple reason that the “average joe” in China, and foreigners too for that matter, can wander through the Forbidden City – for so it is still named. It is not quite a living museum, although a detachment of soldiers are garrisoned there, where their drill and parading can be evaluated under the critical eye of retired drill masters and parade ground veterans from every army in the world, now turned ambling tourists. But much of its appeal lies in the fact that if you close your eyes and remove the surging, chattering masses, you can see a gentle royalty and sense the hush of a bureaucracy in action. Buildings remain the same, as do pavements and walkways, verandas, gates and walls. Unlike many areas of Europe rebuilt from the rubble of wars, you know that where you are walking is where the Emperors and their families trod as well. As you progress through the city you are drawn, before being ejected out into the street, into the Imperial Garden. Something of an inner sanctum where various emperors over the centuries came to relax, and to be themselves. It is a gnarled garden with twisted trees, weathered rock and worn pavement, among which grow the largest and most striking dahlias I have ever seen. And while admiring them one afternoon I was startled by two leathery, middle aged Chinese men who silently stepped into a bed of them, placed arms around each other and posed for the camera. Once the photo was taken they smiled at each other and stepped away. Not trampling the flowers but not taking too much care either. I nearly laughed out loud as the image tumbled around in my head. What would any of the emperors have thought of that? What were the other visitors thinking? No one seemed too bothered by the scene, although this really is a place for observing “do not touch” protocols. What did they mean by the pose – while China is a community based society it is not my experience that men show this sort of affection for each other. Were they so overwhelmed by the experience of the Forbidden City that they forgot where they were? Perhaps they were wired a little like me and instinctively sought out the perverse or contrary pose. Or maybe the answer is simply they are dahlia lovers. That is it! 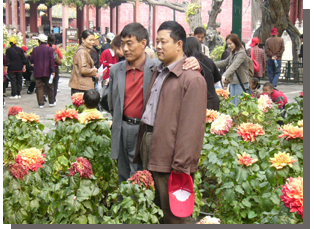 Here are the Chairman and Secretary of the Peoples Great Beijing Dahlia Admirers Society. Picture for the cover of this years annual report. Who knows? But in a land of rules and compliance, in the heart of the Imperial Garden, in the holy of holies of the Forbidden City, this pair struck an appealing chord with my sense of humour and my sense of the absurd. And of course with that part of me that increasingly appreciates seeing two friends showing affection for each other.